Thank you for your interest in Biopotential Electrodes and Lead Wires. Please complete and submit the form below and an ADInstruments representative will aim to get in touch within one working day. If you’d like to speak to someone immediately, office contact information is available from the contact page. A 10-pack of unshielded lead wires suitable for use with any Bio Amp. 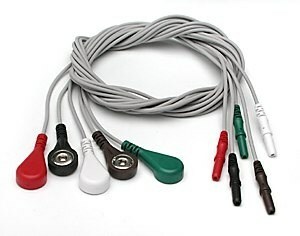 The lead wires are 1 m in length with 4 mm 'snap-on' connectors for use with Disposable ECG Electrodes, Reusable ECG Electrodes and Chest ECG Electrodes. 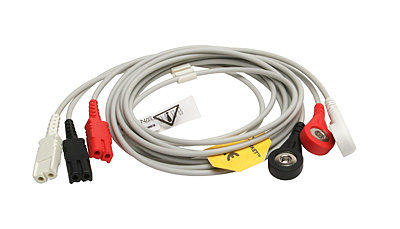 Can be connected directly to Quad and Octal Bio Amps and to Single and Dual bio-amps via a Bio-Amp cable. 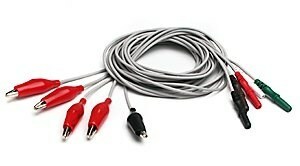 The lead wires are 1.8 m in length with 4 mm 'snap-on' connectors for use with Disposable ECG Electrodes, Reusable ECG Electrodes and Chest ECG Electrodes. A 3-pack of unshielded lead wires suitable for connection to the 3-lead Bio Amp Cable (unshielded). 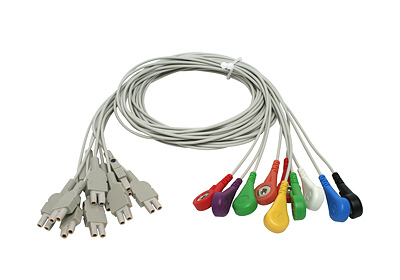 The lead wires are 98 cm in length with 4 mm 'snap-on' connectors for use with Disposable ECG Electrodes, Reusable ECG Electrodes and Chest ECG Electrodes. Can also be used with the Quad and Octal Bio Amp. May be cold sterilized and left to air dry. Unshielded lead wires for use with the Bio Amp cable (unshielded). Suitable for use with the Dual Bio Amp and PowerLab 26T and PowerLab 15T. Can also be used with the Octal Bio Amp. A 5-pack of unshielded lead wires suitable for use with any Bio Amp Cable. Can also be used with the Octal Bio Amps. 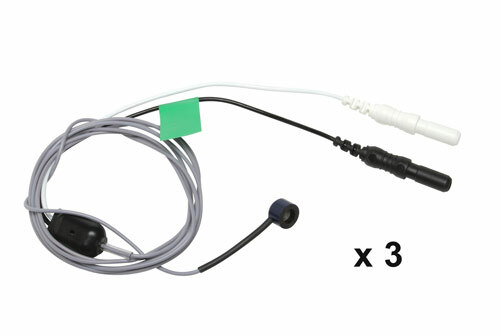 Shielded Biopotential Electrodes (Ag-AgCl, 4 mm, 3 pk) designed to record biopotentials such as EMG, EEG via the 3 Lead Shielded Bio Amp Cable. The 4 mm sensor is made from a fine grain, homogeneous mixture of Ag-AgCl compressed and sintered for strength and stability. The electrode is 1 mm thick and encapsulated in durable housings. Supplied with PVC insulated lead wires and terminated with 1.5 mm safety sockets. 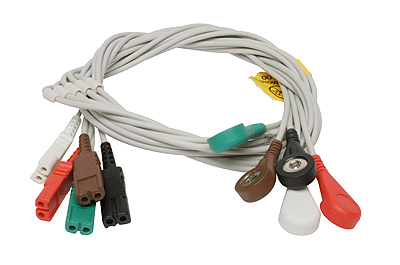 Used to record biopotentials such as EMG, EEG via the 5 Lead Shielded Bio Amp Cable. The 4 mm sensor is made from a fine grain, homogeneous mixture of Ag-AgCl compressed and sintered for strength and stability. The electrode is 1 mm thick and encapsulated in durable housings. 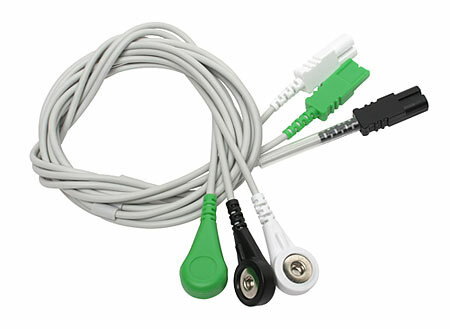 It is supplied with PVC insulated lead wires and terminated with 1.5 mm safety sockets. Shielded biopotential electrodes used to record biopotentials such as EMG, EEG via the 3 Lead Shielded Bio Amp Cable. The 8 mm sensor is made from a fine grain, homogeneous mixture of Ag-AgCl compressed and sintered for strength and stability. The electrode is 1 mm thick, encapsulated in durable housings and has a 2 mm hole for injecting gel. 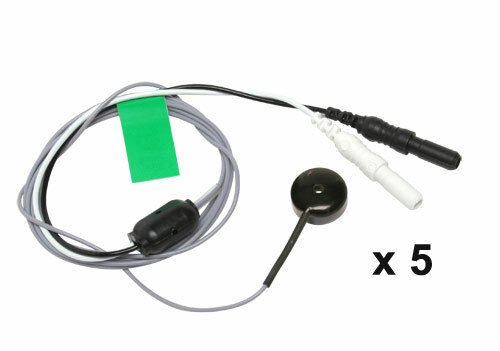 Shielded biopotential electrodes used to record biopotentials such as EMG, EEG via the 5 Lead Shielded Bio Amp Cable. 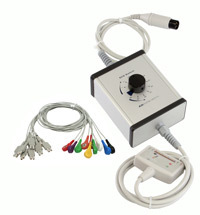 Suitable for use with any ADInstruments ECG 12 Lead Switch Box. 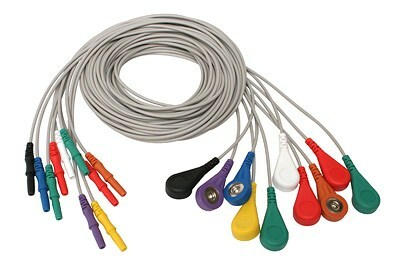 Lead wires are 1 m in length with 4 mm 'snap-on' connectors for use with Disposable ECG Electrodes, Reusable ECG Electrodes and Chest ECG Electrodes. Used with either 3 Lead or 5 Lead Shielded Bio Amp Cables. 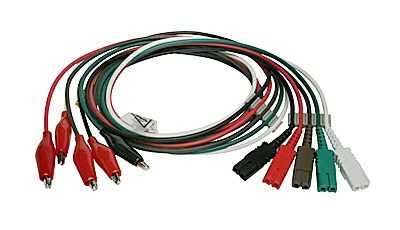 These shielded Lead Wires are 25 cm in length and used with the 5 Lead Shielded Bio Amp Cable. 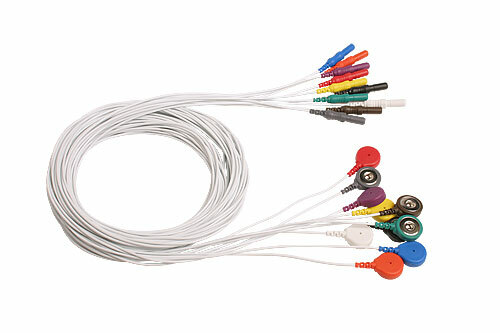 The alligator clips connect to any electrode and are also suitable for use with the ADInstruments Nerve Chamber with Cable Options C.
A set of five shielded lead wires (25 cm) with Micro-Hooks. The Micro-Hooks are constructed of molded nylon with a stainless steel spring and gold-plated beryllium copper hooks. Used with the 5 Lead Shielded Bio Amp Cable. 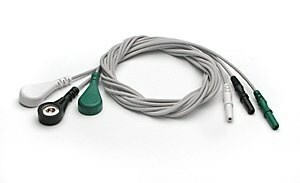 Supplied with the Nerve Chamber with Cable Options C.
Suitable for use with the 5 Lead Shielded Bio Amp Cable. Can also be used with 3 Lead Shielded Bio Amp Cable if required. May be cold sterilized and left to air dry, but do not autoclave. Suitable for connection to the EOG Pod. Similar to the Shielded Lead Wires (B/R/W, 3 pk) and, therefore, can also be used with the 3 Lead Shielded Bio Amp Cable but noting the color differences. 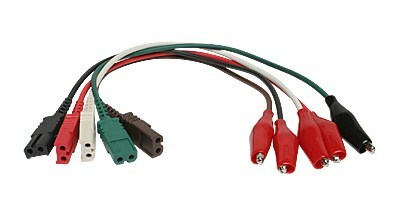 Suitable for connection to the 3-Lead Shielded Bio Amp Cable. Similar to the Shielded Lead Wires (B/G/W, 3 pk) and, therefore, can also be used with the EOG Pod but noting the color differences. If electrical interference in your signal is a problem, you may benefit from using shielded subject cables and lead wires.